I walked the 800 kilometers of the Camino de Santiago from Saint Jean Pied de Port in France to Santiago de Compostela in the northwest corner of Spain in 2006. Once a pilgrim always a pilgrim and so it was that soon after my return to Milan I got interested in the Italian portion of the Via Francigena. The most traditional route of the Via Francigena enters Italy in Valle d’Aosta at the Gran San Bernardo Pass on the Swiss border and winds for 900 kilometers to Rome passing through Valle d’Aosta, Piedmont, Lombardy, Emilia-Romagna, Liguria, Tuscany and finally Lazio. A variant that connected to the Camino de Santiago enters Italy at Monginevro on the French border with Piedmont near Val di Susa. The two main trunks of the Via Francigena meet in Vercelli. While walking the Camino de Santiago in Spain you cannot help but be struck by the fact that the path is so well maintained and that there are extensive efforts to help the pilgrims in their trek. For the vast majority of the walk you are on dirt trails and there are places for pilgrims to sleep almost every 15 kilometers that sometimes are free (you can leave a donation) and rarely cost more than 8 euros (in 2006). Most towns have at least one restaurant where pilgrims can have a full meal for about 6 euros. 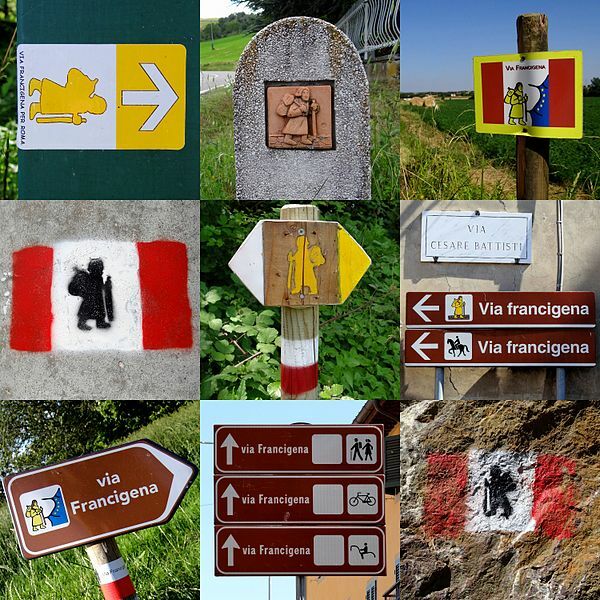 Not coincidentally, thousands of people from all over the world walk the Camino de Santiago every year yet in Italy the same cannot be said for the Via Francigena. An informal poll confirmed what I expected – not only is the Via Francigena rarely walked, but many Italians do not even know what it is or why it is significant for the history of their country. One of the by-products of this is that the services along the Via Francigena are very limited and those people who do walk it often must sleep in expensive traditional hotels, buy pricey meals in restaurants and do long stretches of the trek along busy asphalt roads. There is nothing wrong with expensive hotels and pricey meals (except that they tend to be expensive and pricey) though they ruin the spirit of the long pilgrimage. The Italian government has made half-hearted attempts at improving its historic pilgrim trails – including a pledge by Cultural Minister Francesco Rutelli in February 2007 – but the funds have usually been too limited to make a significant difference. After deciding to walk the Italian portion of the Via Francigena and as I began to plan my trip I realized how unfortunate it is for Italy that the road has fallen into such disuse because it could be an instrument to help people (both Italians and foreigners) discover the country. If the path were developed in a proper way that respected the environment, it could become a wonderful way to increase tourism in parts of Italy that are not often visited by foreigners (or even Italians). And so was born the idea for the walkforitaly.com blog, which sought to add something to the other initiatives seeking to improve and promote the Via Francigena. There is no reason why the Via Francigena cannot again become as important as the Camino de Santiago, which had also fallen into disuse until two people, with the help of the Spanish government, invested time and resources in the 1970s to whip the historic trail into shape.